Buy Link: https://fanlink.to/TheHitMan Sometimes it really is all about the remix! 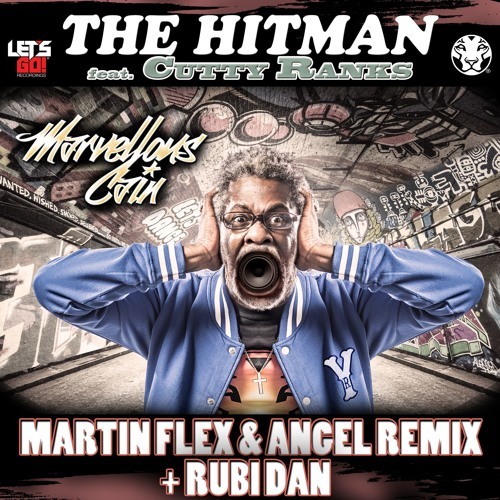 And to prove this point, Let's Go Recordings, roll out this exceptional remix from Martin Flex & Angel featuring the vocal talents of Rubi Dan. Most remixers' are contempt with utilising the existing vocal. Seldom do we witness the recruitment of an extra MC on a remix, but this crew really wanted to make an impact. Phat breaks & booty 808's is the order of the day as the Hitman fires at anything that moves. Martin & Angel are gunning for a peak-time breakbeat burner on this one whilst taking no prisoners. Well let's face it, what Hit Man takes prisoners? The Hitman bassline is tightly locked down and it needs to be as Rubi Dan is firing off ragga riddims faster than a Mustang in chase movie. 808 snares & claps drive the rhythm section as Hitman crescendos in a blaze of bass, breaks, 808's and ragga bliss. The only issue a DJ will have with this is one is, what to follow it up with? Jump to the flip for a remix by Martin & Angel with less vocal. The original jungle mix is also included in the package for those who like their breaks at a 160bpm.